In 1626, Manhattan was bought for $24.00 worth of beads ... or so it is said. Who really knows?! 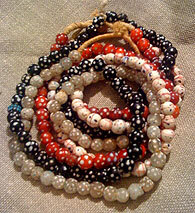 Beads have certainly been responsible for many spirited moments. Traded worldwide, a handful of those little baubles could provoke the strangest of outcomes—changing lives, histories, and landscapes in their travels, and stringing their stories with the passing of years. Since early human existence, mankind has been shaping the elements and worshiping its gems. Our Neanderthal ancestors were the first to show this aspect of abstract thinking, creating and adorning themselves with beads. Their lives were intertwined with the medallions they wore. It was here that these tokens and talismans, these beads, were born 100,000 years ago, setting us apart as a species. The drive for creative expression ran deep in our blood ... and still does. Our forbears may have had to brave fighting the great wildcats for prize "beads," but today it's a little easier and a lot more fun. Beadniks hasn't been around since the sabretooths, but they've been on Main Street in Brattleboro for 25 years. Beadniks offers so much more than beads and ready instruction in working with them.... The store also carries a wide selection of fossils, gemstones, jewelry, postcards, retro toys, vintage gifts, tin signs, and old-school candy, just for starters. Also some needlecraft and felting supplies. 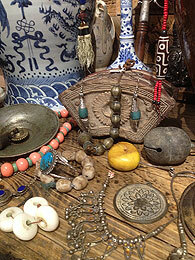 Stop in 7 days a week to explore this trove of treasures! So many colors, shapes, and sizes! From shipwrecks to archeological digs around the world, Beadniks has assembled an incredible collection dating from 10,000 B.C. through the last century. 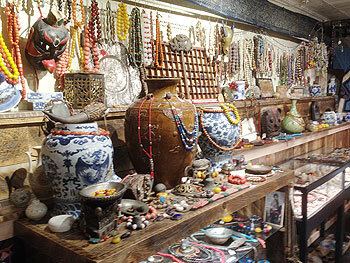 Neolithic, ancient cultures and indigenous artifacts from every corner of the globe are represented in this unique assemblage. 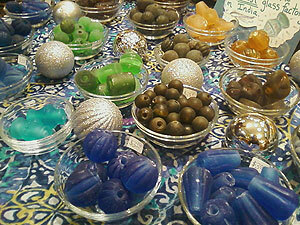 Beads are one of the oldest forms of human abstract thinking ... now you can travel through these gems into history! A guaranteed eye-opener and mindful experience! Open Fri. & Sat. 12 to 4 p.m.